hey jen renee: need something to do this summer? need something to do this summer? Never fear. Because I have a some really great ideas to help you with that 'I'm bored and I don't know what to doooo....' feeling. My first suggestion is an easy one. Do a Dare. I double dog dare you. Every Friday; something new. We've started a Flickr group, making it really easy to participate. Old Dares or new, we want to see what you're doing. Today, we're doing our first ever Twit-Dare. Tweet-Dare. Whatever. On Twitter. If you're already following us, you've heard about it. If not you can see more here. Mine is above. (Click image to read some of my favorite tweets.) We think you should really take 10 minutes today and scrap a little something you've Twittered about. Or if you don't tweet, how about something you've blogged about? Hey, the words have already been written and all you have to do is find a photo. Super easy. Now get to it. Now I want to share a few things that my ultra talented and creative friends are doing this summer. 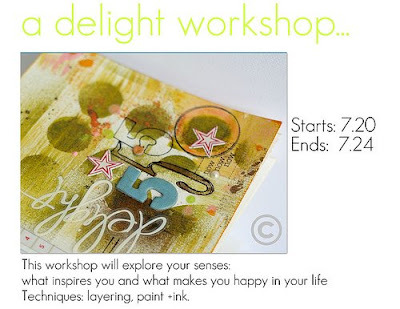 Starting off with Vee's ultra-cool ink, paint and layering mini-book workshop. 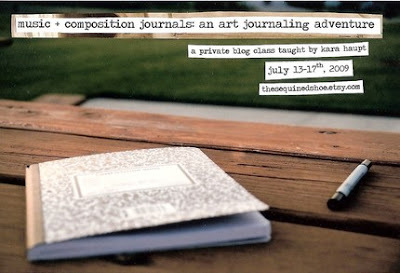 Kara's Music and Composition Journal: an Art Journaling Adventure 5 Day Class. 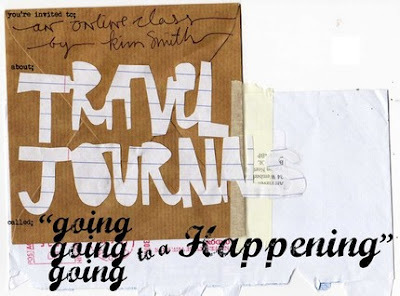 Kim's 'Going to a Happening' online travel journal class. 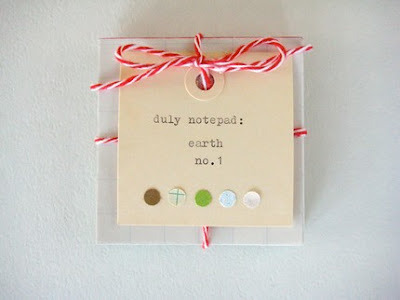 Jamaica's Duly Notepad, which would make a very cute little place to record notes from your summer vacation. 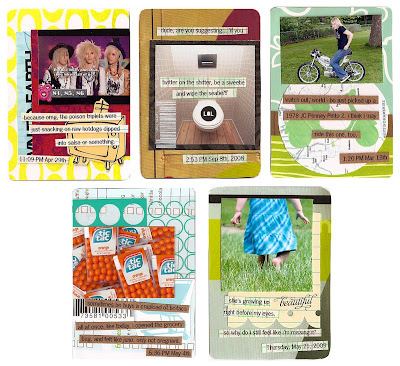 Or check out her Tuesday Tutorial on extremely cool ways to bind little books on Ali's blog. I've been really inspired by her gorgeous photos alone. you're the best, really. too good. i think this officially makes you the cheerleader of our team! which likely makes me the coach. or the bus driver. maybe the team mom? anyways... you forgot to mention doing a tandem-project with a crafty pal. maybe we should make that a dare too? 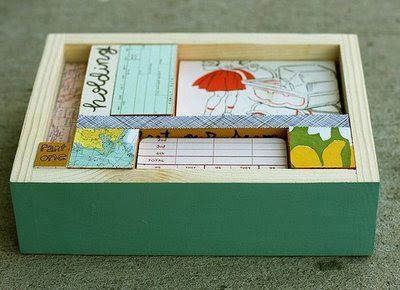 love the idea of a travel journal, especially one as creative as that! i always mean to write in one when i go on trips and never wind up having the time. hey there are some cool classes there. Soon life will slow down I hope and I can do some. Great post! Thanks for the mention, too. We're down to the last one so I'm thrilled that people have loved them. And your o.b. story makes me laugh and feel better. Oh, and I bet it was a man doctor, wasn't it. Oooh. I haven't done a Dare in a loong time. Maybe I can swing one when I'm feeling ho-hum uninspired this week, I'm sure its bound to happen! Not now, tho - cuz those minis/classes/fab photos have me feeling all creative! Yay!